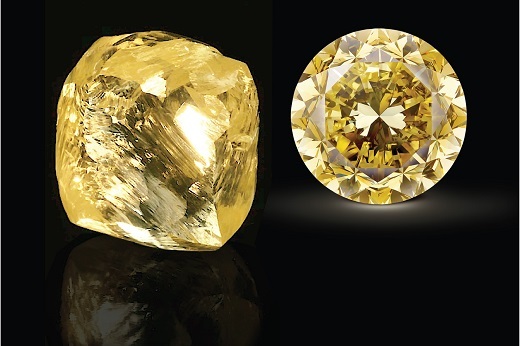 RAPAPORT... Mouawad has manufactured a 54.21-carat polished yellow stone, which, it claims, is the largest of its shape and color the Gemological Institute of America (GIA) has ever graded. In August, Mouawad bought the round, 51.38-carat, D-color, VVS1-clarity, triple-Ex Dynasty diamond from Alrosa at tender. It was the most expensive polished stone the Russia-based miner had sold. The jeweler has renamed the Dynasty — originally the centerpiece of a five-stone collection that fetched approximately $10 million combined — the Mouawad Dynasty. The stone now weighs 51.12 carats and has flawless clarity, Mouawad said. The company will reveal more details about its plans for the stone next month.